It's the first thing you see in the morning and the last thing you see at night. 1. It cuddles with you when you sleep. In fact, you probably prefer sharing a bed with it, because at least your phone does not steal the covers and then deny it the next morning. 2. You're always wondering if you should trade it in for a new one. That iPhone 7 is looking pretty good...but can it really replace your 6? 3. It is a constant source of entertainment. Games, texts, and Insta, much like a naked man, provide endless distraction. 4. You have the distinct feeling you're ignoring your friend on its behalf. You know you ought to spend more time in the "real" word, but it's just *so* addicting. 5. It's the first thing you see in the morning and the last thing you see at night. 6. It automatically corrects you when you're wrong. 7. It puts a filter on bad situation to make everything look better. 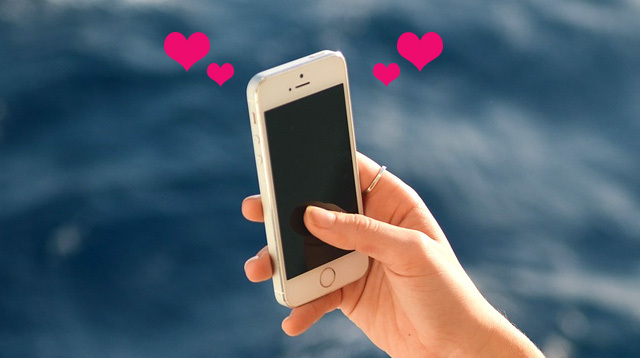 Both bae and Snapchat let you see the world through rose-colored glasses. 8. The service isn't always great. But if you get a better angle, things usually improve. 9. It's distracting during a movie. Whether it's vibrating or talking, you just want it to stfu. 10. It loses energy if you don't feed it. Charging = double bacon cheeseburgers. 11. You love staring at it. You could look at it for ~*hours*~ on end without getting bored. 12. You feel the constant need to check up on it. "Let me just see if I got any emails" = "Hiiii how was your day? What did you have for lunch? Want to watch Stranger Things tonight?" Is it getting warm in here, or is just an overheating battery? 14. Sometimes you just have to put it in the other room. You love it to death but sometimes you need to get far, far, away and just pretend it doesn't exist until its mother has left town. What? 15. You're always asking it for the weather or the time. Why you are so dependent on something or someone else for this basic info is a mystery, but it's just so damn reliable, why wear a watch? 16. You turn it on.